Nick Kyrgios' front-side tweener drop shot against No. 1 Rafael Nadal at Wimbledon en route to the upset of the year. Audacious, thy name is Kyrgios. Gael Monfils's leaping between-the-legs pass: I mean...who does that? 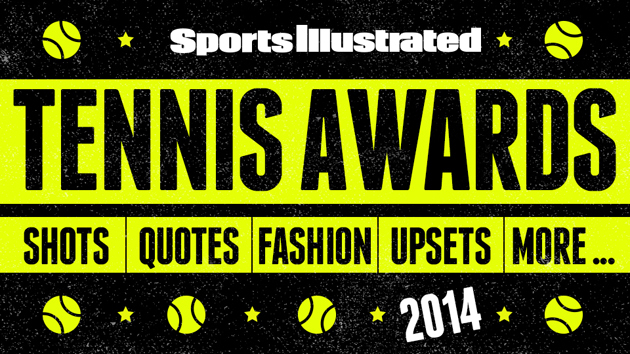 See more of Monfils' hot shots from 2014 here. Grigor Dimitrov's back-to-back magic in Stockholm. What is this sorcery? See more of Dimitrov's hot shots from 2014 here. Jeremy Chardy saves match point against Roger Federer in Rome. Chardy went on to win the match and send Federer home to his newborn twins. Nadal's backpedaling inside-out forehand at Wimbledon. The commentary sums it up nicely: "I swear this guy runs backwards faster than a lot of players run forwards." Stan Wawrinka's no-look gem in the Monte Carlo final. If you out-Fed the Fed, you make the list. Alexander Dolgopolov is the Spin Doctor at Wimbledon. There's spin, and then there's spin. Denis Istomin punctuates the perfect game with an around the net-post special. Novak Djokovic would pull off the same move a few months later. Radek Stepanek hits a diving lob to best Federer in Dubai. Not bad for a 36-year-old. ​Istomin's sliding forehand winner in Tokyo. On match point nonetheless. ​Honorable mentions: Dominic Thiem's scrambling backhand in Rotterdam, David Goffin's one-handed pass at Wimbledon, Federer's backhand stick in Miami, Mikhail Kukushkin's reflex backhand in Shanghai, Nadal's hook-forehand in Miami, and Andy Murray's lunging forehand pass in Cincinnati. Dimitrov and Murray play a marathon in Acapulco: Point of the year? Point of the year. Wawrinka breaks Djokovic in the Australian Open quarterfinals. How Stan became the Man. Kyrgios announces his arrival against Benoit Paire at the Australian Open. Kyrgios would blow a two sets to love lead but he quickly established himself as one of the game's most exciting shot-makers. Federer turns defense to offense with a tweener lob in Dubai. Benjamin Becker didn't know what hit him. Bob and Mike Bryan dazzle against Ivan Dodig and Marcelo Melo at the ATP World Tour Finals. Tweener vs. Tweener! Dustin Brown goes for glory against Nadal in Halle. Brown would pull off the upset but Nadal's reflexes got the better of him here. Nadal's Rio defense: Trying to hit through Rafa on clay? Good luck. Run, Tommy, Run! Federer puts his good friend Tommy Haas on the run in Indian Wells and the 36-year-old German shows he's still got some spring left in those legs. Djokovic's match point against Nadal in Miami. The Serb has an uncanny ability to summon his best tennis on match point. Feliciano Lopez vs. Mikhail Youzhny in Shanghai: This is just very, very good tennis.